Agape Spain News: Archivo Cero (File Zero) at the Granada Hall of Comics and in the newspaper too! Archivo Cero (File Zero) at the Granada Hall of Comics and in the newspaper too! 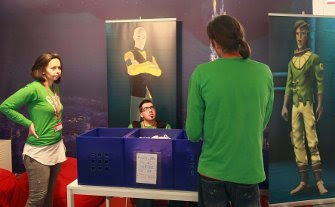 This past weekend Archivo Cero was present at the Hall of Comics in Granada. Our fellow staff Marc and Eva were very pleased because they got a visit from a group of young people that they had met at the Hall of Comics in Málaga a few months ago. When the group came up to the table, they told Marc and Eva that they were looking for them at the comic book fair and that they have been following the series and they even asked when the next chapter would be published. Marc and Eva say that this is a sign that, little by little, Archivo Cero is sowing its seeds and beginning to see the fruit of followers among young people. It´s also noteworthy that the digital newspaper Granada Hoy echoes the news of the Hall of Comics and snapped a photo of our fellow staff and the Archivo Cero stand. If you´re interested in reading the article about the event you can access it here. We are committed to establishing spiritual movements everywhere so that everyone in Spain has the opportunity to see, hear and experiment the gospel from the testimony of a team of people who truly follows Jesus. "My dear Joel, I´ll see you in heaven"